GQ Korea‘s annual “Men of the Year” feature celebrates men who have contributed to culture in some way, and this year’s issue is no different in featuring a high-profile ensemble of actors, athletes, artists, and entertainers (including Shinee‘s Taemin). Among the familiar faces and expensive names, however, one might make the reader pause, though he’s dressed in the same sleek black suits as the other honorees. Freshly 19, it’s not hard to forget that Bobby is still technically a trainee when he’s everywhere these days, making him the man of the moment — or in GQ’s judgement, man of the year. 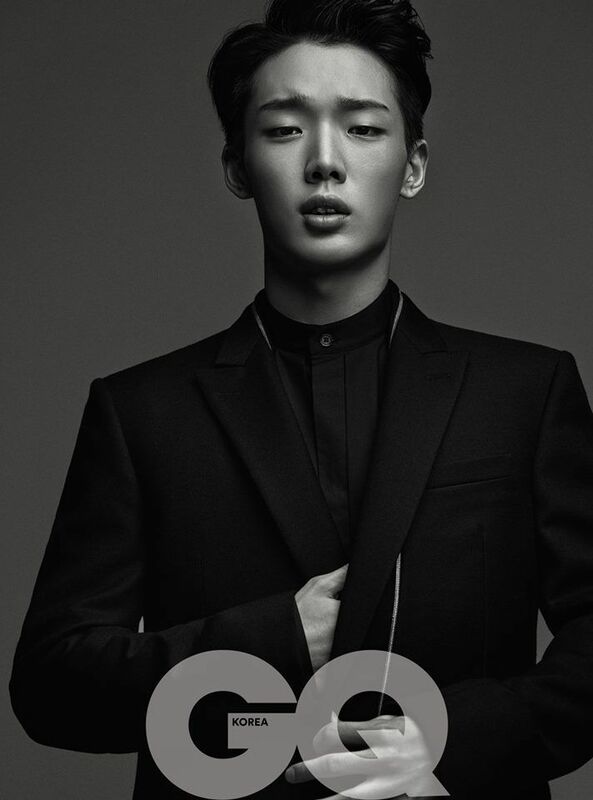 Bobby was first introduced as one of eleven trainees to appear in YG Entertainment‘s survival debut program. Officially dubbed WIN: Who is Next, the program divided the trainees into teams and pit the two against each other in what YG described as “the scene of a fierce battlefield between groups A and B.” Bobby, along with members B.I, Jin-hwan, Yun-hyeong, Jun-hoe and Dong-hyuk, made up the younger Team B. The ten-episode run, however, saw Team A take the winning title (literally), as Kang Seung-yoon, Jin-woo, Mino, Seung-hoon and Tae-hyun received a higher number of public votes and the right to debut as YG’s upcoming boy group WINNER. So what of Team B and Bobby? From the first press release, WIN had garnered criticism for coming across as rather harsh and cutthroat in nature towards the losing team of trainees. While previous debut programs existed — Big Bang and Mnet Battle Shinhwa — these shows had televised trainees competing to secure a spot in a group. None until WIN had featured two fully formed teams vying for debut, and YG’s statement from the start suggested that the losing team would face disbandment or member changes. Which is what happened to Team B, kind of. September saw the announcement of a second survival program, Mix and Match featuring none other than the boys of Team B and three additional YG trainees competing for a spot on the seven member boy group iKON. In a twist, Bobby, B.I and Jinhwan had been guaranteed debut, leaving the fate of the remaining six up to fan votes. Ultimately, Mix and Match was pointless as a survival show given that the original members had already established a fanbase (and therefore, the necessary fan votes) through WIN, and the superfluous addition of Chanwoo was the only change given to the group. Ultimately, Mix and Match served more effectively as a spotlight of the trainees’ skills. I think survival is the optimal setting to strengthen your skills. You rip each other apart and hurt each other, you learn your own flaws, it’s extremely hard and you go through a lot emotionally, but when it’s all over, you’ve definitely improved. And improve he did — simultaneously with Mix and Match shootings, Bobby and B.I auditioned and joined Mnet’s rap competition show Show Me the Money 3. While B.I was eliminated in an earlier round, Bobby went on to win the entire program and the accompanying prizes of 100 million KRW, a concert stage, and the opportunity to release a solo album. Show Me the Money 3 was perhaps what cemented Bobby’s reputation as a rapper regardless of his idol title, following his success over more senior hip hop artists including Vasco, CJAMM, and Iron as well as acknowledgement from the judges. For his efforts in Show Me the Money 3, Bobby became every YG song’s trendiest accessory, starting with Epik High‘s “Born Hater“. Following “Born Hater” came his featuring for sub-group HiSuhyun‘s “I’m Different”, as well as YG’s second hip hop project with the song, “Come Here”, a collaboration with Masta Wu and his Show Me the Money mentor Dok2. Beyond featurings, Bobby generated some murmurs of his own in the music world for his self-penned diss tracks “YGGR #hiphop” and “Put Your Guard Up and Bounce” which targeted idol rappers, with some lyrics suggesting a more direct diss to certain individuals and groups including Rap Monster, Ravi, and Boyfriend. Regardless of actual intent, the tracks drew responses from both idols and netizens alike, demonstrating Bobby’s influence as a hip hop artist and as an upcoming idol. I just want to try getting really big. I want to make a lot of money, have lots of sad experiences…If I had to pick something, I want to experience something heartbreaking. Not even from a lover, but being left by a friend I loved, or something. On Show Me The Money 3, I said that I wanted to crush the prejudices against idols. That was all from the heart, and that’s why it was so natural to write. For Bobby, he’s well on his way — the only thing left to do is to actually debut.